Emily and Jamie had such a perfect wedding day. We could not be more excited to share a few of the highlights of the very special event that was captured by Lisa Hessel Photography. The event took place at St. Louis' Westwood Country Club and was a fitting venue for this outdoor ceremony and stunning reception. Planning was executed by Jenny Kehm of Before I Do. We had an amazing time collaborating with Exclusive Event's on some of the focal elements for this day. It's always a pleasure to have such a knock out team and make memories for our special clients and their guests. We wish Emily and Jamie the warmest congratulations. It was such a pleasure getting to know them and their families along the way. These stunning bridesmaids bouquets feature coral peony, oranges roses, pink ranunculus and soft spray roses. Emily's bridal bouquet was a massed oval design that featured blush peony, coral peony, garden roses, dendrobium orchids and spray roses. The ombre wedding aisle held up perfectly even in the breeze as the colors moved from coral, orange, pink, blush and then to bright white. The backdrop was a collaboration with Exclusive Events Inc. 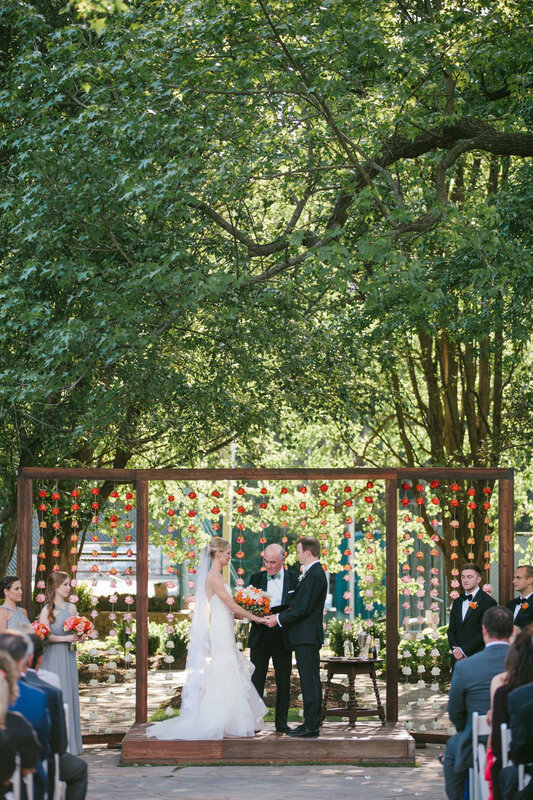 They constructed a three sectioned arbor that provided Festive with a space to create the ombre rose backdrop. Paper design was created by the talented team at M. Haley Design. The cake was created by the fabulous team at Sugaree Baking Company. The floral and geometric treatment was another collaboration with Exclusive Events Inc. They produced a geometric chandelier that Festive treated with blooms and floral garland in the event theme. It was a fantastic way to bring a focal element to the ceiling.